The Ventilator II is an effects device that emulates and faithfully reproduces the famed Leslie Model 122 rotary speaker sound. 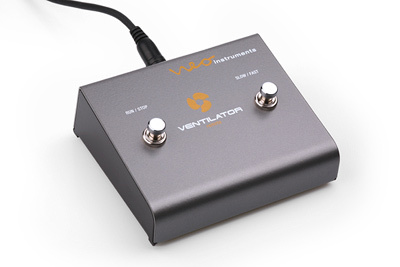 The company, based in Fulda Germany, is manufacturing the Ventilator ll as a second-generation piece to its successful Ventilator and a companion to two existing “mini VENTs” designed for both guitar and keyboard. The original Ventilator was used by many high profile touring artists including Chuck Leavell (Rolling Stones) and Craig Frost (Bob Seger). 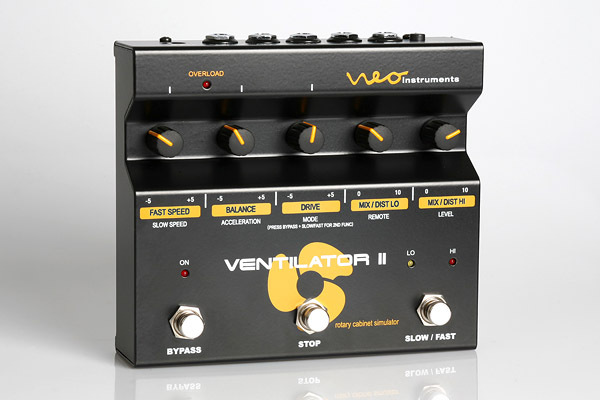 The Ventilator II is being used on the latest tours including Dawes, James Taylor, Styx, and many other major artists. Housed in a rugged metal chassis measuring 6”x 5.25”x 2.25” the Ventilator II fits easily on the top of a keyboard rig or on a pedal board. Three rotary pots allow adjustment of rotor Speed Control (slow to fast), Balance, and Drive. In addition, separate pots control a unique virtual mic placement feature – one for the lo and one for the rotary high – that simulates different microphone positions for each “driver”. Three footswitches provide Bypass, Speed Control, and Stop. Please note: All Ventilator products utilize the same 12V DC power supply. We recommend using the factory supply for best results.